MENOU D’AULNAY, CHARLES DE, sea captain, lieutenant to Razilly, and governor of Acadia; b. c. 1604 at the Château de Charnisay (France), son of René de Menou, councillor of state under Louis XIII, and of Nicole de Jousserand; d. 1650 at Port-Royal (Annapolis Royal, N.S.). D’Aulnay belonged to a very ancient noble family that originated in Perche. His second name came from the seigneury of Aulnay, near Loudun, bequeathed to him by his mother. Charles de Menou served first in the navy, as his cousin Isaac de Razilly’s lieutenant. When Razilly was appointed governor, Menou went to Acadia (4 July 1632), where he became one of his most active collaborators. Almost every year he went to France with pelts, fish, or masts, and brought back supplies. He borrowed funds, hired ships, and recruited men. Since Razilly’s interests, at least at the beginning, were linked with those of the Compagnie de la Nouvelle-France, d’Aulnay acted both in Razilly’s name and in that of the company. But this system gave rise to difficulties and in 1633 d’Aulnay found it very hard to get the company to pay his seamen. A private company, Razilly-Condonnier, was organized in 1634, and from then on d’Aulnay acted only for it. In 1635 his commander, Razilly, entrusted him with a dangerous mission. The post at Pentagouet, founded by Claude de Saint-Étienne de La Tour in about 1625, had been captured by the English, who still held it. Razilly instructed d’Aulnay to retake it with the help of Charles de Saint-Étienne de La Tour. The latter had agreed to co-operate with Razilly, but refused to work under d’Aulnay, who none the less managed to retake the post and to defend it against an English counter-attack. But in the following year the Compagnie de la Nouvelle-France, where the La Tours could number some friends, granted the Vieux-Logis at Pentagouet to Claude de La Tour. This conflict was to give rise to a long and costly rivalry between the two competitors. Isaac de Razilly’s death in 1635 was a severe blow for Acadia. But the majority of his collaborators remained at their posts, and the colony was not prevented by his death from receiving substantial reinforcements at the beginning of 1636. Claude de Launay-Rasilly, the dead governor’s brother, had been granted Port-Royal, La Hève, and the Île de Sable in his own name, and inherited his brother’s shares in the Compagnie de Razilly-Condonnier. His family responsibilities and his post in the navy prevented him from coming personally to Acadia. 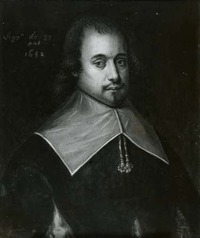 According to Nicolas Denys he made an arrangement with his cousin Charles de Menou, whereby the latter became his lieutenant in Acadia, while he himself looked after the company’s affairs in France. This temporary measure worked for several years, without d’Aulnay’s having the title of governor. The right to nominate to this office belonged to the Compagnie de la Nouvelle-France; for various reasons it did not consider nominating d’Aulnay, who nevertheless exercised absolute authority at La Hève and Port-Royal, in perfect accord with Claude de Rasilly. He very soon decided, no doubt in agreement with his chief, to set up the colony’s principal post at Port-Royal. This site offered a double advantage: it had fertile lands, which La Hève lacked, and it was hoped to establish salt-pans there, in order to be able to gather near at hand the salt needed for the fisheries. Claude de Rasilly sent salt-makers, and the construction of dikes was begun. The majority of the settlers at La Hève gradually came and established themselves at Port-Royal, where agricultural development advanced at a good pace. Meanwhile the old bipartite administration continued to exist in Acadia, under the authority of the Compagnie de la Nouvelle-France. D’Aulnay, as Rasilly’s lieutenant, was in command at Port-Royal and La Hève, whereas La Tour commanded at Cap de Sable and the Saint John River. Each of them received one-half of the revenue from the trading concession and had the right of inspection in the other’s territory. This system could not but lead to clashes of interests and personalities. D’Aulnay, already on bad terms with Nicolas Denys, apparently wanted to assume some measure of authority over La Tour and to insinuate himself into his affairs. Their disagreement was submitted to the court; Boutilier, on 10 Feb. 1638, sent d’Aulnay a letter setting out rules of conduct, signed by the king. This letter made a most clumsy attempt to divide up the Acadian territory between the two lieutenants. It granted d’Aulnay the title of lieutenant-general in Acadia, confirmed his authority over Port-Royal and La Hève, and assigned to him the direction of Pentagouet. If his status had been only a subordinate one up to then, this letter, in the absence of an explicit commission, recognized his powers and was evidence of the court’s confidence in him. The same year d’Aulnay married Jeanne Motin, daughter of Louis Motin, an interested party in the Compagnie de Razilly, and sister-in-law of his colleague Nicolas Le Creux Du Breuil. This marriage was a clear indication of his intention to settle in the country. At about the same time La Tour, despairing of seeing his rival leave, was inveigled into acts of aggression. He is said first to have incited the Indians against him, then in 1639 to have intercepted a pinnace sent to Pentagouet and to have held the nine men of the crew prisoner. In 1640 d’Aulnay, himself returning from Pentagouet with two small ships, came under cannon-fire from La Tour, and one of his vessels lost its mast. 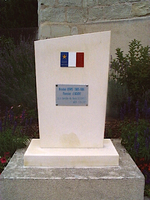 This rash aggression turned to La Tour’s disadvantage: Pierre Jamin, the captain of his ship, was killed; La Tour himself, as well as his lieutenant Desjardins Du Val, and the whole crew were taken prisoner. On the intervention of the Capuchins, an agreement was made whereby La Tour recovered his liberty, while the matter was reported to France. These incidents marked the start of a minor war between the king’s two lieutenants in Acadia. The struggle caused the loss of several lives, engendered a goodly number of useless proceedings and negotiations, consumed their energies and their money for five years, and left them both half ruined. While Jamin’s widow, backed by Desjardins, was obtaining the seizure at La Rochelle of the Saint-François, the Compagnie de Razilly’s ship, d’Aulnay was having reports prepared, and through the intermediary of his father he submitted his complaints to the Conseil du Roi. The skirmish of 1640 helped considerably to strengthen his position. In the following spring the ships brought to La Tour an order to go to France and give an account of himself, and d’Aulnay received instructions to administer La Tour’s forts. In accordance with these orders La Tour handed over the fort of Cap de Sable, which it was difficult for him to defend, but refused to leave the country and took refuge at the Saint John River settlement. The same year the Dutch made a number of forays on the Acadian coasts, so that d’Aulnay had at the same time to defend himself against La Tour, to assist Pentagouet which was constantly threatened, and to assure the defence of Acadia. To face these dangers he had asked the company for 30 or 40 men as reinforcements, but he received only six. Claude de Rasilly, hampered by the Jamin lawsuit, had managed to liberate his ships and pelts through the intervention of the Compagnie de la Nouvelle-France. But these vexations had blocked the fur trade and caused losses. By way of encouragement the partners granted d’Aulnay, on 15 Feb. 1641, a free share in the company, but they could not do more. D’Aulnay went to France to seek help. During this trip he was extraordinarily active, and with his father’s support he succeeded in obtaining considerable advantages. He first tried to clarify his standing with the Compagnie de Razilly. The principal person concerned was still Claude de Launay-Rasilly. But the latter had already poured vast sums into Acadia without getting anything in return. Moreover, the open war that had just been declared between his lieutenant d’Aulnay and La Tour offered the prospect of serious difficulties. Neither he nor his partners were inclined to sink more funds in this ruinous undertaking, but thought rather of withdrawing. As d’Aulnay, on the other hand, seemed full of hope and ready to commit himself to the full, the partners arranged to give him a chance and to ease the way for him to take effective control of the company. Launay-Rasilly, by a notarial contract dated 16 Jan. 1642, made over to d’Aulnay his four shares, worth more than 60,000 livres, and his rights over La Hève and Port-Royal, for the paltry sum of 14,000 livres, payable in seven years at the rate of 2,000 livres a year. In addition he gave him (19 February) 4,000 livres, charged against his expected inheritance from his brother’s estate, so that d’Aulnay could purchase the Rivière Sainte-Croix concession. Furthermore, thanks to the help of Father Pascal de Troyes, d’Aulnay became the administrator of the share that Cardinal Richelieu had given to the Capuchins. 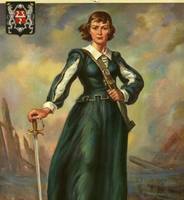 Thus, from being a mere lieutenant, d’Aulnay rose to be master of the greater portion of Acadia. To meet his new obligations and to finance the colony, he concluded agreements the following May with a Huguenot merchant of La Rochelle, Emmanuel Le Borgne, who became at the same time the man responsible for fitting out his ships, his banker, and his business agent. That same year Le Borgne made him an advance of 18,000 livres so that d’Aulnay, with the aid of some relatives also, was able to charter three ships and purchase a fourth. He thus returned to Port-Royal with imposing forces. As soon as he arrived he despatched three gentlemen and four seamen to notify La Tour of the court’s new orders. But La Tour, on an angry impulse, crumpled up the documents and imprisoned the messengers. D’Aulnay then resolved to cut off his supplies, in order to starve him into submission. D’Aulnay’s ship, the Vierge, remained five months at the mouth of the Saint John River and managed to stop La Tour’s supply ship, the Saint-Clément, and an English ship from putting in there. A landing was attempted but it failed. La Tour did, however, succeed in rejoining the Saint-Clément and in getting to Boston, where he chartered four merchant ships, with which he returned to the Saint John. Faced by these superior forces, d’Aulnay prudently withdrew to Port-Royal. La Tour followed him there, but his English allies refused to attack the fort, and, with 30 volunteers, he had to content himself with attacking a mill defended by some 20 soldiers. He was able to set fire to it, kill three men, and take a long-boat loaded with pelts. This second attack showed d’Aulnay how vulnerable his position was. If the English, with their superior strength, had wanted to attack the siege would have been difficult to withstand. D’Aulnay immediately started building a new fort. This attack did, however, furnish him with fresh arguments against La Tour. He had reports prepared by the provost André Certain, by the Capuchins, and by former supporters of La Tour, drafted two long statements himself, and went in person to France to request further help. He obtained a new decree from the council, on 6 March 1644. Le Borgne disbursed 50,000 livres for the thorough fitting-out of a ship, and hired out to him a 200-ton frigate, the Grand Cardinal, armed with 16 cannon. Meanwhile a man in his trust, the sieur Marie, probably a Capuchin in civilian clothes, went to Boston to protest against the help given to La Tour. D’Aulnay’s ships, one of which was commanded by Bernard Marot, took up their watch again off the Saint John settlement. In the spring, learning that La Tour had left his fort to go to Boston and discuss plans, d’Aulnay decided to attempt a siege. He put some cannon ashore, brought his ships up in front of the fort, and submitted it to a bombardment that destroyed part of the parapet. After promising to allow his soldiers to pillage, he gave orders for an attack on Easter Monday 1645. The fort fell, despite a desperate resistance. It seems certain that a number of the 45 defenders perished on the spot and that the others were hanged, except for a few who were pardoned. Mme de La Tour, née Françoise-Marie Jacquelin, was taken prisoner and died soon afterwards. D’Aulnay had lost eight men and paid compensation to their families. The victor then had the La Tour fort restored and considerably strengthened, and set up a profitable trading-post there. According to Denys, he traded as many as 3,000 moose skins a year at this post. 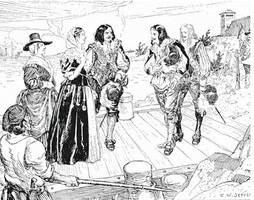 The king and the queen mother wrote to him on 27 and 28 Sept. 1645 to congratulate him and to promise him a supply ship. But they neglected to send it, and d’Aulnay, the following year, reminded them in vain of their promise; he never received any material aid from the court. The trade in pelts constituted his sole source of revenue. To help in the support of the colony, he adopted the expedient of felling trees, organized seal-fishing, and developed agriculture. The question of a peace treaty with the New England states, which had been debated since 1643, remained in abeyance. An initial agreement with Boston, signed in 1644, was ratified in September 1645. But d’Aulnay claimed an indemnity of 8,000 louis for the losses caused by the English merchants who had supported La Tour. His three delegates were received most courteously in Boston, and after three days of discussion signed a treaty with the New England states. As symbolic reparation, d’Aulnay was offered a sedan-chair taken by a pirate from the viceroy of Mexico. In February 1647, thanks to Séguier’s patronage, d’Aulnay received very generous letters patent from the court, in recognition of his services and to compensate him for his huge expenses. After a laudatory reference to his services, the letters confirmed him in his powers as governor of the whole of Acadia, from the St. Lawrence to the sea and as far as Virginia, and he obtained the sole privilege of the trade in pelts, to the exclusion of all competitors. But these same letters, obtained without the recommendation of the Compagnie de la Nouvelle-France, aroused the latter’s protests, the more because d’Aulnay had already anticipated their tenor and was applying them rigorously. He had, indeed, begun, in 1644 and 1645, to send his ships to patrol along the coasts in order to seize the fishing vessels engaged in trading in pelts and he had also seized some ten ships from the Basque country, Bordeaux, and Brittany. In 1646, in the Gulf of the St. Lawrence, he had even captured some long-boats belonging to the Compagnie de Miscou. In September 1647 he took possession of Fort Saint-Pierre at Cape Breton, which belonged to Gilles Guignard and of the fort of Nipisiguit (Bathurst, N.B. ), which had been granted to Nicolas Denys. These harsh acts, which it was difficult to justify, resulted in numerous counter-seizures and proceedings before the Admiralty courts, and in appeals to the Conseil du Roi. But d’Aulnay’s standing at court was very firm, and the company’s protests were heard only in 1652, after the death of the governor and of his father. Despite his efforts, d’Aulnay was never able to repay the annual expenditures required by the colony. The accumulated deficits already came to more than 200,000 livres in 1648. Le Borgne, refusing to contribute further, went to Port-Royal to demand payment of his arrears. A somewhat sharp altercation resulted and Le Borgne had to go back with an empty ship. He started legal proceedings and had the estate of d’Aulnay seized. The governor was not checked by these difficulties, and he found other suppliers at Nantes and Bayonne. He was engaged upon clearing further tracts of land when he died suddenly, on 24 May 1650. His canoe capsized in the Port-Royal basin, and he died of exhaustion after remaining an hour and a half in the icy water. He left eight children, all quite young, and a heavily encumbered estate. He had drawn up his will on the preceding 20 January. Burial was in the church at Port-Royal. His father, René de Menou, became the children’s guardian, and his widow, Jeanne Motin, by an ironic twist of fate, became the wife of his former adversary La Tour. What he achieved was appreciable. According to the testimony of the earliest settlers, he had had three forts built, equipped with 60 cannon, and he maintained garrisons there. He had fetched some 20 families from France, and in order to establish them he had brought grass-lands under cultivation, organized two farms at Port-Royal, and cleared stretches of land at Pentagouet and the Saint John River. To supply his settlers, he had three or four ships come each year from France; he had two mills constructed, and built two small ships of 70 tons, five pinnaces, and several sloops. He had also established two schools, and at his death he left a population of about 500 souls, divided among four posts and served by 12 Capuchins. These results may seem rather slight, but they assume considerable proportions when one remembers that d’Aulnay obtained them by his own efforts, with no official help. Such achievements betoken a high degree of intelligence and energy. While his rivals were almost entirely concerned with trade, d’Aulnay’s ambition was to establish a lasting colony, and he realized that this could be done only by settling families in the country and by giving them the means of subsisting on the spot and by themselves, through the cultivation of the land, through fishing, and through industry. The colony that he left in Acadia was well rooted and vigorous enough to resist the English occupation and the 20 years of neglect that followed. That is enough for d’Aulnay to deserve consideration as a great colonizer and as one of the first architects of the plan to give to the Atlantic provinces a European population. Information on this period is found chiefly in the memoirs of d’Aulnay and La Tour and is often contradictory. The original sources are: AN, Col., C11D, 1, ff.63–81; BN, MS Fr. 15621, ff.265–72, 18593, ff.365–415, and NAF 9281 (Margry), ff.69–129; “Mass. Archives”; and ACM. See also Archivum Sacrae Congregationis de Propaganda, Rome, Lettere Antiche, 260, f.25, Ignace de Paris, “Brevis ac dilucida . . .” (“Brève relation de la mission d’Acadie . . . 1656”) (photocopy of the original with a translation in PAC, FM 17, 1; see PAC Report, 1904, App. H, 333–41); and Denys, Description and natural history (Ganong). Several documents are reproduced in Coll. de manuscrits relatifs à la Nouv.-France, I, 115–26, II, 351–80 passim, in Mémoires des commissaires, I, x, xlviii, 46–47, 71, 79–84; II, 281–86, 495–96; IV, 169–74 passim, 203–8, 219, 223–49 passim, 259, 260–68, 272–74, 280–81, 302–5, 393, 446–47, 451, 517, 531; in Memorials of the English and French commissaries, I, 15, 53, 118–19, 147, 155–56, 347, 349, 353, 367, 375–81, 385, 401, 403, 525, 571–76, 711–12; and in the works of Couillard Després and Candide de Nant [infra]. Several modern historians have sided violently with d’Aulnay or with La Tour, and their works contain more polemic than history. Célestin Moreau in his Histoire de l’Acadie françoise (Amérique septentrionale) de 1598 à 1755 (Paris, 1873), Émile Lauvrière in La tragédie d’un peuple: histoire du peuple acadien de ses origines à nos jours (2v., Paris, 1922; éd. rev., 1924) and in Deux traîtres d’Acadie et leur victime: les Latour père et fils et Charles d’Aulnay (Paris et Montréal, 1932), and Candide de Nant in Pages glorieuses are partial to d’Aulnay. Azarie Couillard Després defends the memory of La Tour in his Observations sur l’histoire de l’Acadie française de M. Moreau, Paris 1873. Réfutation et mise au point (Montréal, 1919), in En marge de La tragédie d’un peuple de M. Émile Lauvrière ou erreurs sur l’histoire d’Acadie (Bruges, 1925), and above all in Saint-Étienne de La Tour. Rameau de Saint-Père, Une colonie féodale, and Parkman, The old régime, are more objective. See also two articles in RHAF: XI (1957–58), 218–41, “Charles d’Aulnay et la Compagnie de la Nouvelle-France,” by René Baudry, and XVI (1962–63), 469–501, “La seigneurie de Charles de Menou d’Aulnay, gouverneur de l’Acadie, 1635–1650,” by Geneviève Massignon. René Baudry, “MENOU D’AULNAY, CHARLES DE,” in Dictionary of Canadian Biography, vol. 1, University of Toronto/Université Laval, 2003–, accessed April 22, 2019, http://www.biographi.ca/en/bio/menou_d_aulnay_charles_de_1E.html.